Mr. Nashville: RHONDA VINCENT CELEBRATES CHRISTMAS TIME WITH APPEARANCES ON "MUSIC CITY ROOTS," TBN'S "PRAISE THE LORD" AND RFD's "RENO'S OLD TIME MUSIC"
RHONDA VINCENT CELEBRATES CHRISTMAS TIME WITH APPEARANCES ON "MUSIC CITY ROOTS," TBN'S "PRAISE THE LORD" AND RFD's "RENO'S OLD TIME MUSIC"
NASHVILLE, Tenn. (December 14, 2015) – The countdown to Christmas is on, and Rhonda Vincent is celebrating with multiple TV appearances, including SiriusXM’ s “Bluegrass Junction” and “Music City Roots” on Dec. 16 and TBN’s “Praise the Lord” on Dec. 17. The International Bluegrass Music Association’s Female Vocalist of the Year’s latest album, Christmas Time,has received rave reviews. The critically-acclaimed project has recently been featured in The New York Times, The Wall Street Journal, and the Boston Globe, to name a few. You can also read an in-depth interview with the six-time Grammy nominee in the latest issue of NASH Country Weekly, where she opens up about the recording process of the star-studded album, which features collaborations with Dolly Parton, Willie Nelson, Charlie Daniels, The Oak Ridge Boys, Ronnie Milsap, Lorrie Morgan and more. Bluegrass fans are in for a treat as Vincent returns to SiriusXM’ s “Bluegrass Junction” on Dec. 16 for a very special episode of “Track-by-Track.” Tune in as the reigning IBMA “Female Vocalist of the Year” opens up about all 12 songs from the instant holiday classic, which recently received a 4 out of 5 star rating in Country Music People magazine. The show, which is hosted by Kyle Cantrell, premieres on Dec. 16. Vincent makes her return to the popular Jim Lauderdale-hosted show “Music City Roots” on Dec.16. The special John McEuen 70th Birthday Jam and Christmas show airs live at 7pm CT, and will also feature performances by Sam Bush, Jerry Douglas, Jesse McReynolds and more. Broadcast on Wednesday nights from 7pm to 9pm, CST, “Music City Roots,” Live From The Factory showcases Nashville’s astonishing music scene, from Country and Americana to more progressive interpreters of tradition — a “roots and branches” format that brings together fans of different tastes and generations. Presented live from the stage of the The Factory, this show showcases purveyors of authenticity across many genres. Fans can stream the show LIVE, or listen in at musiccityroots.com. TBN’s hit show “Praise the Lord” will also feature Vincent performing songs from Christmas Time. The unique holiday-themed episode will bring the Christmas spirit front and center on the faith-based program, which is hosted by gospel singer Jason Crabb. The program brings the highest caliber of guests from well-known celebrities to laypersons for interview, as well as, singers, musicians, evangelists and the coverage of revivals and crusades from around the world. This award winning program has been on each week night for over 30 years. 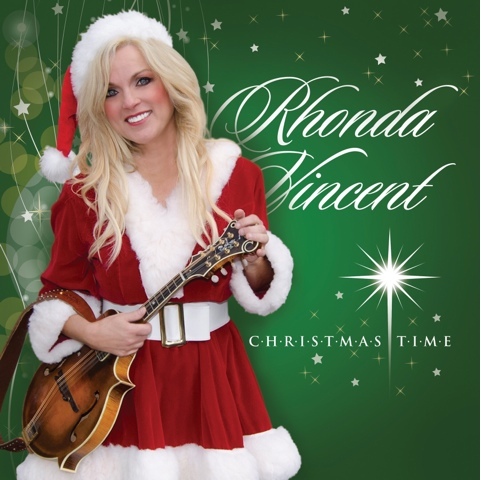 Catch Rhonda Vincent’s episode on Dec. 17. Rhonda Vincent returns to RFD’s "Reno's Old Time Music" to co-host a very special episode of the new series, "Hats Off to Bluegrass." Just in time for Christmas, Rhonda and Ronnie introduce the best holiday-themed performances by Reno's guests, as well as share personal stories of the season. Rhonda also treats fans with a delightful performance of one of her favorite holiday tunes. The episode is set to air from December 19-24 on RFD-TV (check local listings).